Looking for an easy, fun, affordable and different morning out with your littlies? 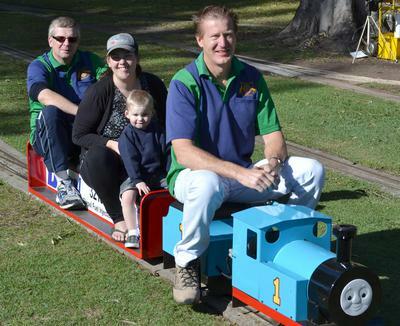 Then head to McPherson Park at Bracken Ridge for cheap miniature train rides. On the fourth Sunday of every month, from 9.30am - 2.30pm, the Members of the Bracken Ridge Lions Club don their train drivers hats and release their fleet of miniature steam trains for the public to ride for only $2. The trains are the perfect size for toddlers and their parents (and of course the bigger kids too) and there is even a train which resembles Thomas. With multiple trains chugging along at the same time, it is only a short wait at the shaded station before a train is available. Staff make the effort to keep families and friends on the same train so they can enjoy the trip together. After departing the station, the train winds it way along an extensive track through the trees and runs alongside the oval passing the other trains with a 'toot toot'. All profits from these train days are given back to the community (click here to find out more). So not only will you have a fun day, but you'll be supporting an organisation which supports so many. Why not make a day of it? With a small range of markets, sausage sizzle, a small, uncovered playground, toilets and plenty of shaded spots perfect for a picnic, it has the makings for an easy and fun family outing. The train day will be finishing at 2pm on Sunday 23rd December.